Description: And so it begins, the GEVO invasion of the BNSF...train H-BRCNTW with three new GEVOs along with the GE test car. Description: Loaded coal train powers through Mound City crossing. Description: In DPU mode shoving out of town. 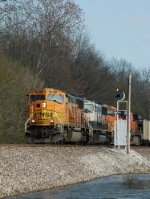 Title: BNSF 5722 and 5919 gently nudge a SB coal drag. Description: This BNSF duo heads up a unit coal train passing through Joliet, IL, on this day in 2008. 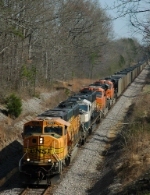 Description: With a string of coal cars behind, the BNSF duo continue east. Description: A Southbound BNSF Loaded Coal Train crosses the famous Santa Fe Bridge at Larkspur on the way down the Colorado Joint Line, and eventually towards Texas. Description: Rolling down one of the ex-ATSF Portions of the Joint Line. Description: Southbound BNSF Loaded Coal Train rolling off the ex-ATSF flyover for the run into Palmer Lake. Description: From the top of a frozen Palmer Lake we see a Texas-bound coal train headed south down the Colorado Joint Line with GEVOs on the point. This gives us a good comparison between the production version, and the pre-production version second out. They're bascially ES44AC's on the inside, the builders plate says AC4400EV, and the BNSF model designation is AC4400CW. Title: Incoming! we've got hostiles take cover! Description: Empty Thomas Hill coal train E-THHNAM0-73 passes through Baird Interlocking in the Lincoln Terminal. Description: M T Kincaid coalie.